Do you really need a funnier title for an online a slot game? Microgaming has got you covered with the quirky titles. Not your average run of the mill slot game, Poke the Guy resembles more of an arcade game. All you have to do is hit the Guy frolicking about on screen with a wide range of different objects. Claiming to be one of the first developers to create the very first true online casino software, Microgaming has been around since 1994. Then in 2004, they created the very first mobile casino software. Based on the beautiful Isle of Man, they are proud to be able to give something back to the community. With two new games being released every single month, they focus on responsible gaming that is enjoyable too. They certainly know what they’re doing when it comes to creating unique and quirky games! Poke the Guy really is one of a kind and very unique for that matter. The aim of the game really is just to poke the Guy-well hit with random objects. The map which acts as the backdrop is very eye-catching. However, whenever you click on an object to catapult it, you have no control over when to launch. You can choose to increase or decrease a bet which does give you some control over how you play. The guy you’re trying to hit is fun, particularly if you’re trying to shoot a rubber duck at him. And all you need to do is wait for the catapult to fire and coins could be coming your way! * Quirky design: with bright colours and attractions from all over the world in the background, the design is possibly the best thing about the game. * Pay-out: by managing to land a hit, it’s possible to get 500x on your original bet. Keep in mind that the payouts are at random though. * Available across platforms: It says it all really. 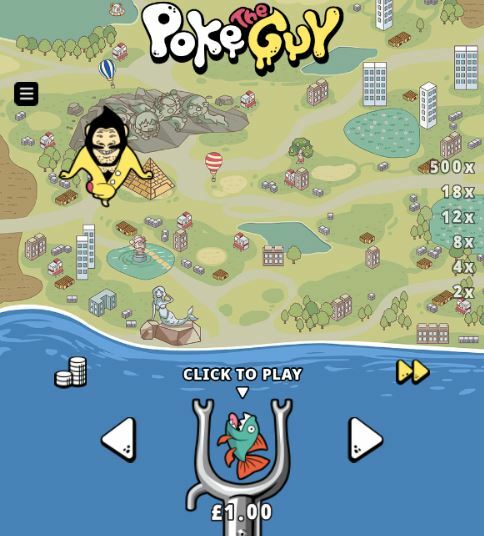 You can play Poke the Guy on mobile, tablet or desktop. The choice of how and where you play is yours.